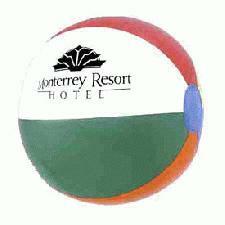 Our Corporate Beach Balls from our Summer Items Department here at Calendar Lady Promotions are excellent beach time advertising promotional items. Just choose how many you want and we'll see that they get printed up with your business details and company logo. So when you give them away to your friends and customers, everytime they go to the beach, your advert will be bouncing around. Also beach balls travel long distances from home so your advert will probably travel the country, if not the world. So promote your business upon our Corporate Beach Balls today! To find out more about our Corporate Beach Balls click here and fill in the contact form and we'll get straight back to you. Other promotional and personalised items besides our Corporate Beach Balls click here.